Kids are getting so obese that a new RCT came out showing metformin can help them lose weight and normalize metabolic biomarkers. It’s not just that inadequate physical activity is destroying the physical vitality, body weight, and metabolic health of children. It’s also ruining their movement skills and general athleticism. I don’t work with kids directly, but I have many friends who do. And all of them, from gymnastics coaches to running coaches to basketball/base/football coaches report that the athleticism of the beginners has degraded over the years. Fewer kids are coming into practice for the first time with that raw movement ability. They’re clumsier, clunkier, and more confused than ever before. Childhood is a big window, but it’s a crucial one. All that time spent throwing a ball—or sitting on the couch manipulating an Xbox controller so that the character onscreen throws a ball—establishes neural pathways. Do you want those pathways to enable efficient, competent throwing (a skill that may have required our big brains and allowed humans to conquer the world), or do you want those pathways to enable skillful button and joystick maneuvering? The good news is that kids love to move. Even the ones who don’t look it. Go down to a park, the beach, or walk through the city square on a hot day when the fountains are flowing and kids of all shapes and sizes will be moving frequently at slow, moderate, and fast paces. They’re playing tag. They’re roughhousing. They’re jumping from ledges twice their height. They’re all over the place. And that’s how it works: Get even the most screen-obsessed kid in a fun, physical environment with plenty of opportunities for movement and he or she will move. The innate desire for physicality and play exists in all children. Overweight kids aren’t too far gone either, and exercise can work wonders. According to a 2015 meta-analysis, there’s “moderate” evidence that exercise by itself is an effective way to reduce bodyweight in overweight and obese children. Another study concluded that strength training and aerobic exercise are more effective at lowering children’s BMI than either alone. I imagine you could optimize a kid’s training regimen even further and get even better results. Ethnographic studies have found that, by and large, kids in hunter-gatherer groups play all day long with little to no supervision (PDF). They don’t have scooters and Laser Tag, or barbells and kettlebells, but they also don’t have smartphones and televisions. For these kids, play is movement and movement is play. There’s no other way. Of course, contemporary hunter-gatherer groups are a very rough approximation of our hunter-gatherer ancestors. The former have been pushed onto marginalized land by better-armed and more numerous city folk; the latter ranged across an untouched world teeming with large game. Even still, they’re the best model we have for ancestral childhood physical activity. But we don’t even have to go back to the paleolithic to illustrate the amount of physical activity the average kid should be getting. Just talk to an elderly neighbor. Talk to an older colleague. Or heck, search within your own memory bank. What were summers like as a kid for you? I for one was out all day long if school was out, exploring the neighborhood, roaming the woods, getting into trouble. And I rarely stopped moving. Anecdotes and personal memories not enough? The data tells the same story. The parents of today’s children got over 8 hours a week of outdoor play (which is still too little). Today’s children get under four. That trend is likely to continue as you go back in time, with outdoor play doubling in frequency and lack of supervision with each previous generation. These are averages, of course. Some kids get quite a lot. Others don’t. Kids in Denmark aged 6-12 average 90 minutes of moderate-to-vigorous physical activity (MVPA) per day. It’s highest in the six-year-olds and declines by 3.5 minutes each year. Elementary school kids in Qatar average around 28 minutes of MVPA per day, with a large discrepancy along gender lines. By age 9, for example, boys are getting over 40 minutes a day and girls are getting just 23 minutes. Even the Danes aren’t doing enough, in my book. Kids should be moving all day. I won’t mince words. Look, my kids probably could have moved more, and I knew about this stuff. It’s hard. I get it. But that doesn’t negate that the ideal situation is for kids to be constantly moving. After all, kids have fatigue-resistant muscles akin to elite athletes’. That’s why they can run all day without getting tired, and that’s a fairly strong indicator they’re meant to move all day. That’s not in the cards, though, so what should kids aim for? To stave off overweight/obesity, 60 minutes of MVPA (moderate-to-vigorous physical activity) with at least 15 minutes of genuinely vigorous physical activity each day is the absolute minimum. That’s not optimal. That’s barebones. What are some ideas? How can we get kids to get enough exercise while having fun and developing skill? Many need a little nudge. There are innumerable ways to unlock what’s already inside. I’ll throw out 30 of them right here. Walk to School. If you can make it work, walking to and from school will contribute a good amount of MVPA to a kid’s life. Extra points for getting into trouble on the way. Swim underwater as far as you can. Dive for Objects. Give kids a goal, make it a game. Throw a handful of quarters into the pool; see if they can get them all in with one breath. Toss a kettlebell into the deep end and have them bring it back up. Biggest Splash Contest. Who can make the biggest splash into the pool? Encourage different dives, cannonballs, jackknives, and other jumps. Water Polo. An excellent training stimulus. One of the hardest sports around. Lift Weights. Real ones. In Germany, 11-year-old soccer players and 12-year-old Olympic weightlifters are safely front squatting their bodyweight. Race the Dog (with a Head Start). Tell your kid to make a break for it, hold your dog for a few seconds, then release. Play Catch. Great way to practice throwing and catching, the latter of which is particularly tricky (and useful to learn). Barefoot Hike. Your kid will thank you when she’s all grown up and thinks nothing of walking across gravel. Creek Walk. Jump from rock to rock, climb over logs, balance on fallen trees, take a little dip. Check Out the local rec center schedule. You’d be surprised at the quality of some of these classes. Gymnastics, dance, martial arts are all good options for building good movement skills. Get a pullup bar in the house. Place it at a level your kid can reach. Start with hanging, swinging, and various holds, but work your way up to pullups. Give incentives (“do 5 pullups and I’ll give you $20”). Get the dog they’ve always wanted, with the stipulation being they have to walk it and play with it. Set up an obstacle course. It doesn’t have to be fancy. Just give them things to climb under/over, crawl under/through/, leap over. Hill Sprints. If you want a killer workout, sling that kid over your shoulder in between his sprints and run some of your own. Gymnastics. Great foundation for movement later in life. Just stop short of elite competition unless it’s something they really want to commit to. Have them race. If you catch kids at the right age, they love races without being attached to the outcome. They’ll just let it rip and go all out, all smiles. Winner and loser both have fun. Roughhouse. Roughhousing is a lost art that helps kids establish boundaries and limits, learn what hurts and what doesn’t, grasp when something is “too rough.” Plus, it’s fun. Try Parkour. Parkour isn’t something a seven year old just leaps into (go to a parkour gym for formal instruction),but they can certainly start playing around on manmade structures. Visit a business park for good climbing and play. Animal Impersonations. Crawl like a bear. Hop like a rabbit. Leap like a frog. Slither like a snake. Walk like a duck. These are very difficult modes of transportation that make for great exercise. To keep things fresh and playful, come up with other animals to emulate. Play Fetch. Throw the ball, they go chase it and bring it back. Same concept as running your dog. Reverse Box Jumps. That cool Persian tot aside, it makes more sense for small children to practice jumping down from tall objects than trying to jump up them. Besides, landing is where the danger lies later. Trampoline. Studies indicate they’re responsible for a large number of emergency visits, but a properly set-up trampoline enclosed by a protective net can be a great place to learn how to jump with good form. And again, fun. Keep a scooter/bike/skateboard around. Kids love zooming around on wheels. Chore Duty. Give them a standing order to help with bags/groceries/trash. There’s always something they can carry, and every little bit helps make them stronger and more resilient. Kettlebell Challenge. Keep a kettlebell in the living room and have him or her lift it every day. Marvel at the perfect deadlift form. Build forts, then destroy them. Try conventional sports. Although specialization isn’t advised at such an early age (it can actually increase the risk of overuse injuries and inhibit the athletic growth of children), sports are fun and do offer a great path to overall athletic development. Set a good example. If you fail to embrace physical culture while demanding your child do the opposite, that’s a strong nudge in the wrong direction. Make sure you’re moving, too. What kinds of games, sports, and other activities do you use to increase your children’s physical activity and help them develop a positive relationship with exercise? What’s worked, what hasn’t, and what’s the most unconventional activity you’ve had success with? 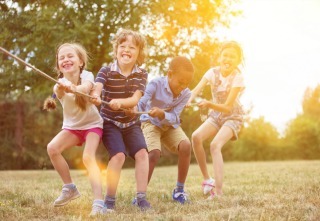 The post How Much Exercise Do Kids Need? Plus, 30 Activities to Get Them Moving appeared first on Mark's Daily Apple.